I tend not to use my recipe books now due to my inability to see the text but one can find all sorts of recipes on the web. This is a real bonus for us who are visually impaired as we can see the recipe with ease using Zoom Text or other magnification programs. I usually copy the recipe text and paste it into a Word document enlarging the text size to REALLY big 🙂 I saw this little nifty idea on Facebook: By using an everyday skirt/pants hanger to clip the recipe into and hang on a cupboard handle, one avoids back ache if recipe is on the counter and the splatters from ingredients or messy fingers! 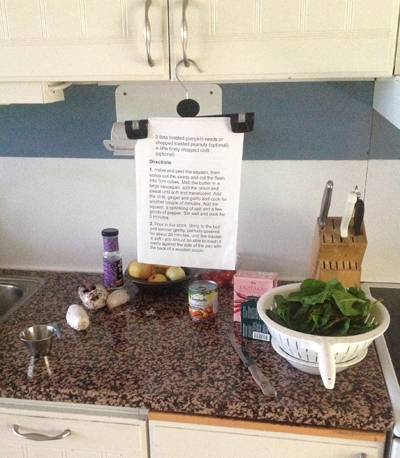 Anyone else care to share other tips and tricks to use when one is a visually impaired cook? Read the article Visual aid for cooks?